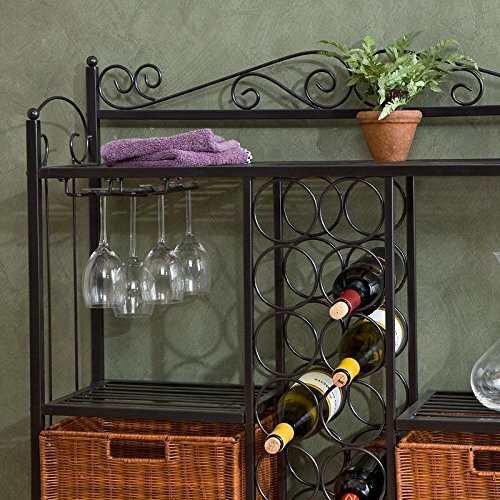 Combine storage, display and organization all into one fantastic-looking piece with the Celtic Bistro Wine Rack. So much more than a wine rack, this heavy-duty metal piece has a spot for everything. Store up to 12 bottles of wine in the center-mounted wine rack, and use the two wicker baskets to hide away any extra clutter. There are also two wine glass racks capable of storing up to two glasses each. The center metal wire shelves are perfect for displaying favorite photos or a pretty vase. Use the full-width top shelf to store dishes and other items, but try not to cover the elegant scroll-work detail that lines the top of the frame.